Double the fun on the blog today! It's Inspiration Monday and it's day one of Megan Mae and Keely's Layer Up! Challenge. And I cleverly managed to make both work for me today! I took the opportunity to share another of my winter coats. We were laughing at the blogger meetup that you can justify having tons of cute coats to pick from in your closet when you live in MN and need to wear one nearly nine months out of the year! So anyway, this one is actually older, I bought it in 2007. I had to laugh when I was out picking up lunch one day a couple of weeks ago, this older lady at the sandwich shop was like following me around in an odd way like she knew me or something. I kind of looked at her and she finally said "I just had to ask where you got that coat, I want one." I had to tell her that it's not exactly new! My sister-in-law crocheted the hat. It's stretchy and roomy which I just love, because my hair doesn't get quite so squished!. Although I have to say, it's not really cold enough outside for a hat today, I more or less did this for the photo opportunity! So now on to Layer Up day one! Today is short sleeve over long sleeve. I was going to do a short sleeved sweater over long sleeves, but then saw my cute little short sleeved blazer getting no love, I know I haven't worn it since this fall and I thought, I'm going to pull this guy out for today! So really, this was a pretty easy outfit to put together. Still loving these shorts I bought over Christmas too! I opted for heels instead of boots today too because again, it's nearly 40 outside today. The rest of the week will be interesting as it's going to be unseasonably warm all week. So, not a week that layers are all together necessary, but I'll do my best to play along anyway! A little sassy leg shot for you here, ha. I do have to say this outfit over all makes me feel pretty sassy! It's Monday, gotta do what you can sometimes! For more information on the Layer Up challenge, visit Megan's blog here or Keely's blog here. And for more Inspiration Monday fun, head over to Two Birds! And as if you didn't have enough links already, there are some photos up on Ruby Girl from the MN Blogger Meetup this weekend, so check them out here! I adore your jacket (although I totally thought it was a top, it fits you so perfectly!)!!!! Cute outfit Beth! 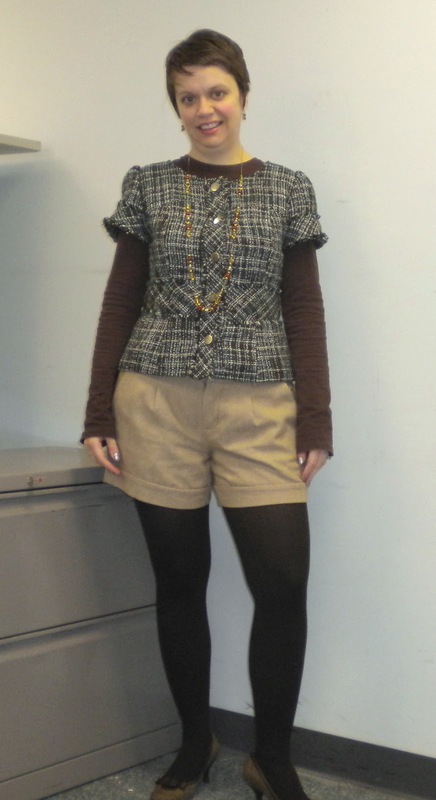 I really love the shorts over tights and that short sleeved tweed top is adorable! Kudos for combining the two looks! i'm loving you in the shorts and tights and heels!! I love the outfit!!! Super cute! I love the combinations. Love the shorts with tights look - so cute! I love people making hats! I got one last Christmas! You look fab here! SOooooo envious of your duffle coat- I probably would have followed you liek the old lady! Also loving those heels- they seem the perfect mid height! Ooh so cute! I Love the double "short over long". That jacket is a perfect fit on you. Seriously perfect. However your coat is really cute, and hopefully the lady is able to go find something similar. Coats are on sale right now! Shorts and tights are great and I wish I coupld pull them off. But I am a little scared too. That jacket is great! I like the hat. Normally I'd be shocked to see someone wearing shorts in MN in January, but not this year! That coat looks so warm and cozy, and I love how you layered the tops and the tights and shorts! I love that look, and I haven't yet done that this year, I need to get to layering! Great look, Beth. I'm kicking myself now for chickening out and putting back the long shorts I tried on at Goodwill that I was considering wearing with tights. Hotsie totsie shot on top of the file drawers Bethie! Super cute outfit! It's been really unseasonably warm in my neck of the woods too (NJ) that I felt a wee silly with my wool coat and hat on too taking pics but we must do what we must do in the name of fashion! Cute! I love the shorts with tights thing but it's never quite gone well when I've tried it. You look fab! Cozy, cozy! Heading to a "Tropical Oasis"